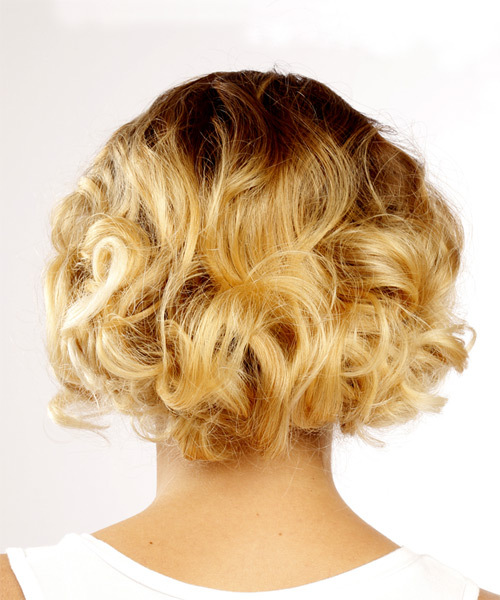 Large corkscrew curls give this casual hairstyle tons of bounce and movement. The top is parted on the side and with the body and volume, this 'do is great to frame a long face. Product is needed for hold and shine and regular trims will help prevent split ends. Our model looks lovely here with a curly ear-length bob. Working with her natural hair texture, this 'do has been styled with her corkscrew curls left loose to do their thing, and add body and bounce all over. This is ideal for her face shape, which is long, as it benefits from the added fullness around the face and cheek area in particular. Our model has a high forehead with a rounded hairline which is ideal for wearing a side part and grown out fringe, as seen here. Our model has a warm complexion with gold undertones and dark eyes. This makes her well suited to brunette, gold and caramel tones the best. Here she goes with a warm, dark golden base color at the roots and sun-kissed blonde through the lengths and ends. This color works well for her and warms up her skin tone, plus it makes her dark eye color even more noticeable. This is a great choice for her coloring and it gives her locks a healthy, shiny finish. Scrunch spray gel throughout the hair after styling to set the curls in this look.